The EUR/CHF currency pair declined on Tuesday and Wednesday to hit a new weekly low at around 1.1320. The currency pair has been on a sideways movement over the last few days trading within the 1.1308 and 1.1385 range. The Euro, in particular, is under pressure from the Brexit stalemate with the latest news indicating that France is unwilling to allow the UK an extension to article 50. News from Brussels also suggests that the EU block could be leaning towards France’s views. A failure to grant the UK an extension to article 50, which would give PM Theresa May more time to try come up with a Brexit deal agreeable to both the EU and British MPs, is seen as a major bottleneck to future economic relations between the UK and the EU member countries. This is likely to have a negative impact on the Euro. From a technical perspective, the EUR/CHF currency pair appears to be trading just below the 100-period and 200-period simple moving average lines in the 240-min chart. This suggests that a bullish movement in the short-term could be on the cards. As such, the bulls will be looking to pounce on the pair by targeting profits at around the 1.1345 level, which also coincides with the 38.20% Fib level. On the other hand, the bears will hope for a continuation of the current decline by targeting profits at around 50% Fib level, which also happens to be a key support zone as depicted in the 240-min chart. 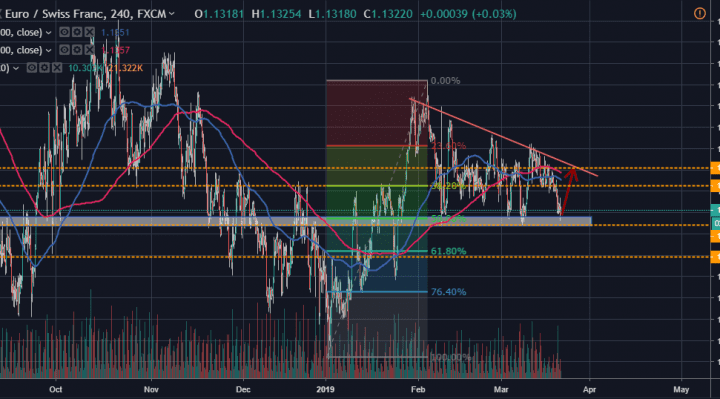 In the daily chart, the EUR/CHF appears to be currently trading within a tight range, but on a broader perspective, it bounced off the crucial resistance zone of 1.1460 at the start of February. And given the pair’s current position, the bulls will be targeting 1.1460 for long-term profits, which also coincides with the crucial Fib level of 38.20% in the daily chart. On the other hand, the bears will look at opportunities at around 1.1204, which is becoming a key support zone. But in the meantime, it looks like there will be a short-term consolidation before a major move is made. 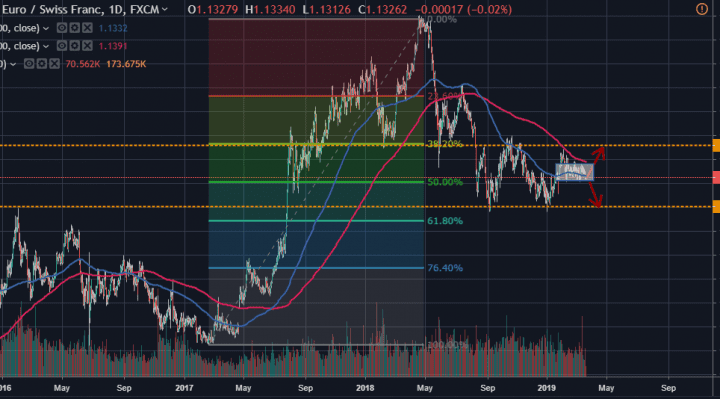 In summary, the EUR/CHF currency pair appears to have a bullish bias from a technical perspective, but fundamentally, it could be under a lot of pressure depending on the developments in the Brexit.